The Spurs roster has changed enough that San Antonio’s versatile forward will have room to contribute. When the six-foot-nine, 230 pound forward out of UCLA declared for the draft after his sophomore year, he had already drawn many comparisons to Boris Diaw. Some saw him as a great fit for the Spurs system. In fact, Anderson said before the draft that he hoped that the Spurs would take him if he was still available. Somehow, Anderson slipped to the end of the first round, where the Spurs happily snatched him up. It seemed like a perfect situation. Anderson would learn the ropes during his first couple of years as a protege of Diaw’s, and eventually become yet another key cog in the Spurs machine. Unfortunately for Anderson, he has yet to find his footing in the NBA so far. There is no question he has talent, especially how well he keeps control of his body. He has definitely proven he has the ability to slow the game down, change gears in an instant, and finish well around the rim with his terrific length. That’s a big reason why his nickname is “Slow-Mo”. For his size, he also possesses outstanding handles. In some lineups, he’s capable of playing the point guard position and running the offense. He is fundamentally sound and takes his time on both ends of the court. But on the other hand, he has often been hesitant to shoot, especially from outside the arc — like Diaw, he has a pass-first mentality. At times, he doesn’t look confident in his abilities. Too often he appears to overthink the situation, tending to try too hard to make the perfect play so as not to mess up anything instead of just playing his game. Because of this, he’s been in and out of Pop’s rotation during the last three years. Last season, he started out the year getting good minutes off the bench. Then Jonathon Simmons started to make good on his potential and gobbled up a good chunk of playing time — leaving Anderson on the outside of the rotation. 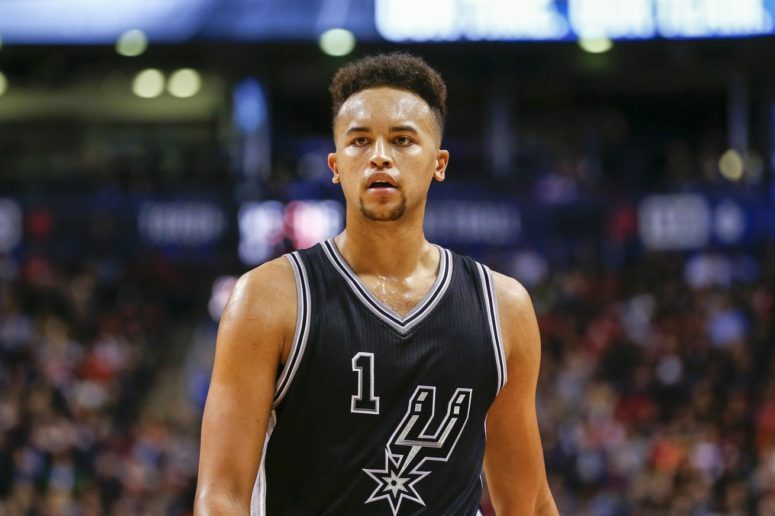 With Simmons gone (signing with the Orlando Magic this summer), and new Spur Rudy Gay coming back from an ACL injury, there’s an opportunity for Anderson to play some important minutes this year for the silver and black. In order for him to earn a regular spot in the rotation, he must be more confident and willing to take chances on himself. Just as Simmons earned more playing time by bursting to the hoop and trusting in his athleticism, Anderson must show a willingness to shoot the ball while continuing to guard multiple positions with his impressive wingspan and reach. He must concentrate on taking more three pointers this year. Last year, he shot a respectable 38% from downtown, but he attempted only 0.6 three pointers per game. His three-point percentage has climbed every year he has been in the league, and this year, his attempts need to go up as well. To put things simply, this upcoming year will be the most important year of Anderson’s career. He’s in the final year of his rookie contract and will be playing for a sizeable pay increase should he perform well. Given that the Spurs are somewhat thin at the four and five spots, Anderson has to show his versatility this year and be willing to play bigger, tougher, and smarter when he’s asked to play big-man minutes in small-ball lineups. Here’s hoping he finally breaks through and becomes a key guy off the bench for the Spurs. not just this season, but also for many years to come.